Pinterest, currently being the hottest social media network is setting up a fabulous trend in photo sharing. Bloggers and Social media lovers have started to pin pinterest to their blogs and websites. 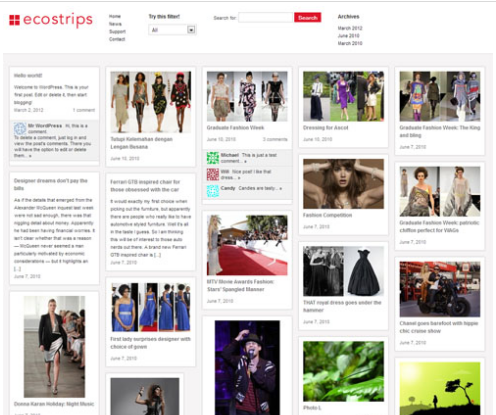 This Pinterest fever has led several blogging platforms like wordpress to come up with themes that look alike pinterest. There are a number of wordpress themes which exactly look like a pinterest template. Here in this article, you will get to know about few premium themes, which are offered at a considerable rate. This Pinterest wordpress theme is offered at $59. 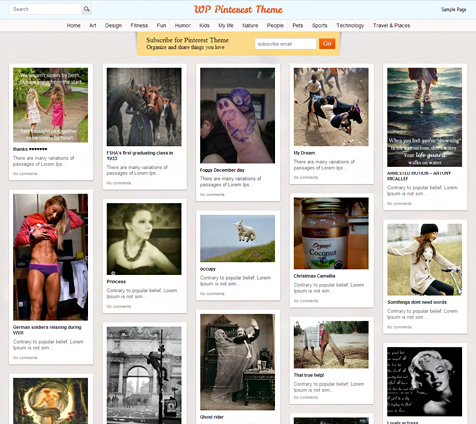 The theme features tableless design with a Pinterest design layout. Here you can upload logo and images easily. The product is compatible with Firefox, chrome, safari, opera, IE7 and IE8. This Apptha theme is flexible to different screen Sizes. Gridnik is a premium based theme which is offered at $30. This theme works with any version of wordpress 3. Flickr, Twitter and Video Widget are few custom widgets that come with Gridnik. It has 9 slick color schemes and 15 font options. The theme is compatible with any screen size. 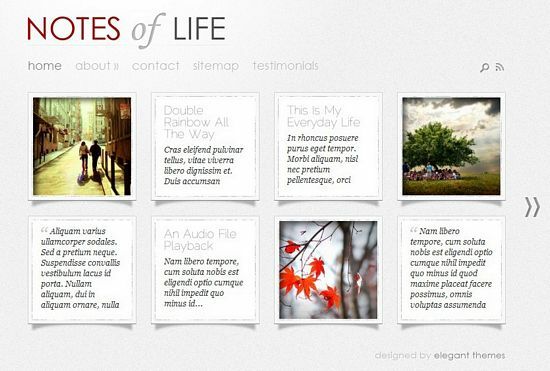 This Ajax powered theme has 20 more useful short codes that include tabs, sliders, twitter and flickr. The Narrow way is a powerful wordpress theme, which is available at $49. It has an excellent Fade / Slide transition option. In addition, there are also autostart and autostop options. It is compatible with WP 3.1. Mp3 player, lightbox galleries, custom slideshows, headerbar options are few features that come with this theme. There is also a post elements control option. Autofocus is offered at $25. It has an excellent custom admin style with front page image crop editing. It is designed with a 800 pixel and 8 column grid quality so that the images stand for their clarity. This theme is compatible with WP3.0. It allows Dynamic Flickr Integration. Zoho is available at $35. This wordpress theme comes with unlimited color schemes, 16 unique pattern options, 5 unique blog layouts, 3 single page layouts and 11 page templates. 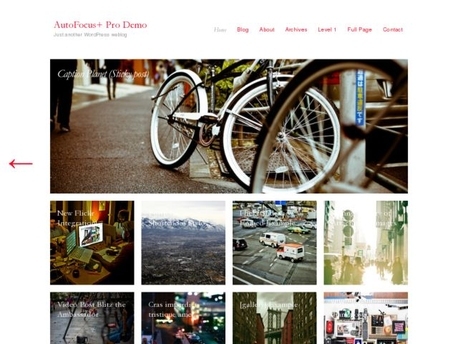 Pinpress is a WP theme offered at $69. 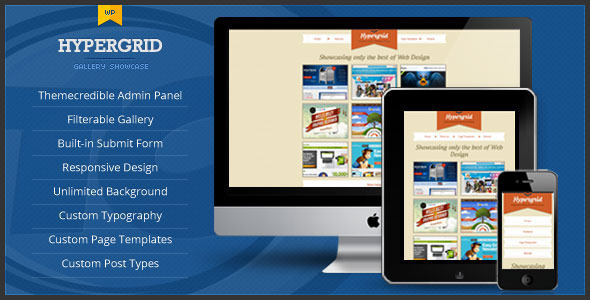 This premium theme is the best for displaying visual arts. Pinpress comes with an amazing responsive design and a complete pinterest like layout. Pinpress is also easy to customize. This is again a WP theme that comes with a premium pack offered at $39 for 84 themes. Daily notes is purposely designed to share your daily life with your circle. This theme comes in four unique colors and is multimedia integrated. Browser compatibility is excellent with Daily notes. Hypergrid is a premium theme offered at $35. Filterable Gallery, Submission Form, Shortcodes, Custom Page Templates, Custom Post Type, Custom Backgrounds, Custom Typography and Theme Widgets the features that get along with this theme. Ecostrips comes at $25. This theme showcases your posts in a dynamic wall that is compatible with any screen size. There is a dynamic filter plugin to filter your posts in just one click. 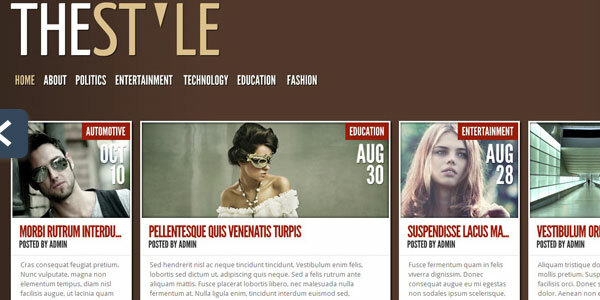 The Style is offered at a premium price of $39 for 84 themes. This theme comes with a modern design that gives a unique visual impact. It is compatible with all screen resolutions. Reflex is available at $35. It is a dynamic portfolio theme that comes with a filterable dynamic grid layout. There are 9 page templates and more than 40 font replacement options in Reflex. This theme is stable in all modern browsers. Bookcase is available at $30. It comes with a unique and interactive portfolio theme, which is perfect for freelancers, web designers, photographers and videographers. 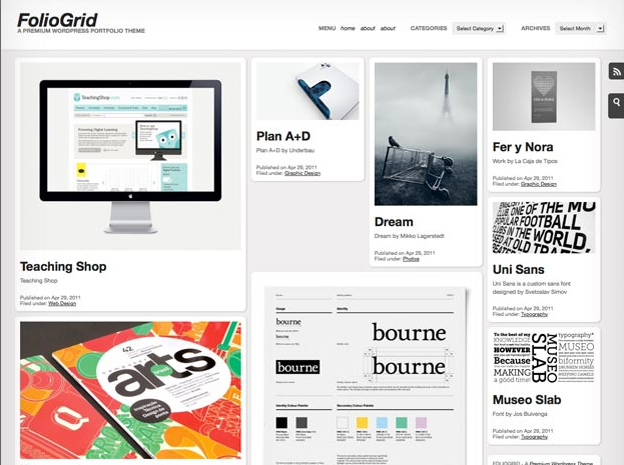 Grid Portfolio Theme comes with a grid like layout. It is offered at $30. This WordPress theme is perfect to showcase any portfolio. Grid Portfolio has nice and unique structure to show any artwork. 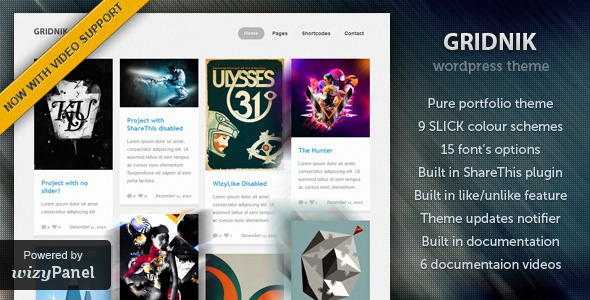 Gridler is a premium wordpress theme, which is offered at $30. This grid-based portfolio is built on a HTML5 wordpress framework. This theme is SEO optimized and comes with useful theme options. 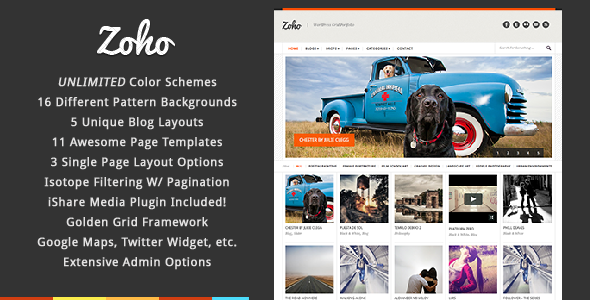 This is again a grid-based wordpress theme that is offered at $40. It supports post format supporting and layout shuffling. 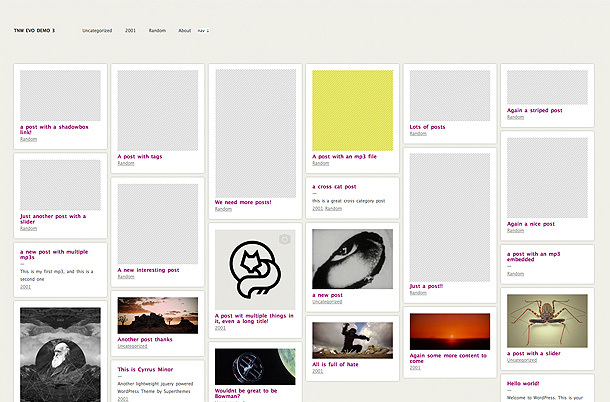 These are few premium WordPress Pinterest themes, which would please you in many ways. So, never mind on spending few bugs since these themes make you feel that you have made a worthy purchase!